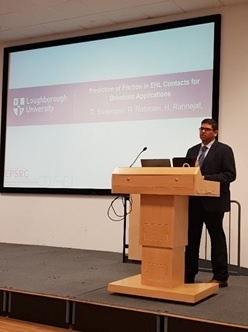 Our Cohort 2 student, Gajarajan Sivayogan, presented at the Powertrain Modelling and Control Conference. Powertrain Modelling and Control Conference is a biannual conference that is hosted by Loughborough University. Specifically the joint efforts of the Automotive and Dynamic Research groups. It hosts numerous automotive driven companies from around the world to show case their latest research and discuss future prospects on the automotive industry. It also gives opportunity for automotive related projects to present their findings in front of industry and academic experts. This allows future collaborations and understanding on the latest research being developed globally. This year’s conference showed increased interest in power control systems and fuel cells. With new technologies driving towards alternative fuels. CDT-EI candidate Gajarajan Sivayogan presented his research work on ‘Prediction of Friction in EHL Contacts for Drivetrain Applications.’ He showed that the real entrainment velocity within a lubricated tribological contact under high loads can have a significant influence and hence a more realistic inclusion of this in the predictive models may lead to a better and more truthful evaluation of frictional and power losses in certain drivetrain applications.